As promised, a new installer image based on the 2019-01-25 update pack. Only Xfce is available, with kernel 4.14 for compatibility with most i686 systems, and for some reason only the minimal profile (not that it makes all that much of a difference). That link leads to LXQT (I mean, the ISO installs LXQT). What, seriously? The Xfce profile which boots into Xfce) installs LXQT? No. It boots LXQT with openbox. The only XFCE in there is the ISO name (I actually prefer LXQT, just wanted to give it a spin). Well, it was the only ISO on the downloads directory and I’m sure I don’t have LXQT installed, so I doubt I made a mistake (I’ll check it later anyway). Wait, I have the thumb with me and it is a 64bit profile. Maybe I made some confusion after all. I’ll download the ISO again. I am thinking about install manjaro32 on an asus eeepc901, 4gbssd and 16ggbssd,1gb ram, the first intel atom, almost no graphic card. So as thinking on fxce as too much, I would rather prefer use lxqt. 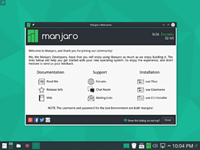 Any advice about how to use manjaro32 with lxqt? Just use Xfce, it works fine on an EeePC 901 (and I’d know, that’s the 32-bit laptop I have and is the whole reason I maintain manjaro32). Did you upgraded it to 2gb RAM?, iI don’t, only have a new internet bought battery. I am downloading and will try it, because I don´ t like to install 2 window managers or desktop environments. So in case I want to try the lxqt I would reinstall with the architect . Did you upgraded it to 2gb RAM? Nope, still the original 1GB. You’ll be able to run Firefox with one or two tabs open - any more than that and things will grind to a halt.